We have a rule around here (that I came up with and enforce) stating that Daddy is in charge of all of Little Sister B's diaper changes on the weekends. Considering I'm up to my elbows in dirty diapers all week long, it seems only fair that he should have two days of dealing with the pleasantries that come along with it. As far as I'm concerned, it's a good rule to have. As well as the actual diaper change, the main aspect that always makes me want to turn and run is the dreaded smell. Not necessarily from the diaper itself (although, that's not always so pleasant) but from the diaper pail. The one that we were using required a fair amount of bending, shoving, twisting and effort... all performed while holding my breath. Even so, the gagging (and nose-plugging) that followed was pretty much unavoidable. Or so I thought. When Mom Central allowed me to join their Diaper Pail Test Team, I couldn't have been more excited. Clearly unhappy with our current system, I had always wanted to try something new but didn't know where to start. Fortunately, Playtex and Munchkin made that easy and I was more than ready to try out both the Diaper Genie II Elite and the Arm & Hammer Diaper Pail. First up was the #1 selling diaper disposal system that has won award after award every year: the Playtex Diaper Genie II Elite. At first glance into the box, I thought that setup for the Diaper Genie II Elite was going to take a while, but after actually pulling the pieces out of the box I realized there were really only two (plus the bag cartridge to set inside). Snapping the top portion of the hinge into the bottom didn't take long and pulling out the bag, tying a knot and inserting the liner was only another moment or two. So, in a few short minutes, I was ready to end the diaper stench in my house! Immediately I liked the taller height of this diaper pail and its easy-open foot pedal. Measuring around 27" high, Playtex has completely eliminated the need to bend down while dropping in a diaper and my back is more than thankful for it. Even better, the foot pedal means that only one hand is needed for the entire process and I don't have to touch a single thing other than the diaper itself. If the pictures don't make it clear, all that's involved in using this system is to step on the pedal (which automatically opens the lid), drop the diaper in (literally just drop it, no pushing it down or smashing it in) and let the lid close. If there's something easier than that, I haven't found it yet! In terms of odor control, the Diaper Genie II Elite is already doing a superior job to our old pail. When closed, it uses a "double-locked" design wherein not only is the lid keeping the smells inside, but the trap-door-like mechanism that is underneath. Combine those with the multi-layered bag and all of a sudden Little Sister B's room doesn't have a continual scent of dirty diapers. Granted, during those few seconds it takes to drop in another diaper and the lid is held open, some of the smell does escape but because it's so quick, it is nothing like what it was and immediately dissipates. When it came time to empty the Diaper Genie II Elite, it also only took a few moments. By pressing the button on the front and opening the diaper pail along the hinge, the bag was easily accessible. Simply slide it along the provided cutter, tie a knot and throw it away. 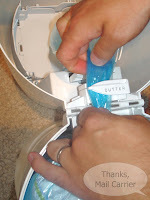 Tie a new knot in the remaining bag, pull down to provide room and you're ready for more dirty diapers. 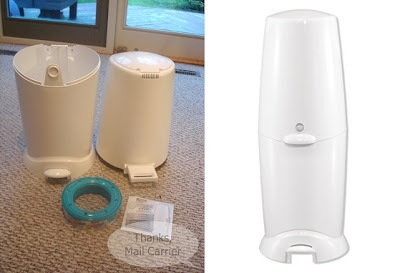 So far, I have found the Diaper Genie II Elite to be extremely easy and very fast to use, which are big pluses when it comes to diaper pails. I really like being able to "toss and go" with one hand (and one foot) and not even have to bend over to do it. I'm looking forward to seeing how this pail stands up to the competition from Munchkin and the second pail we're reviewing! Great review! I have to agree...I love the height of it too. It's nice not having to bend down to throw a diaper in. 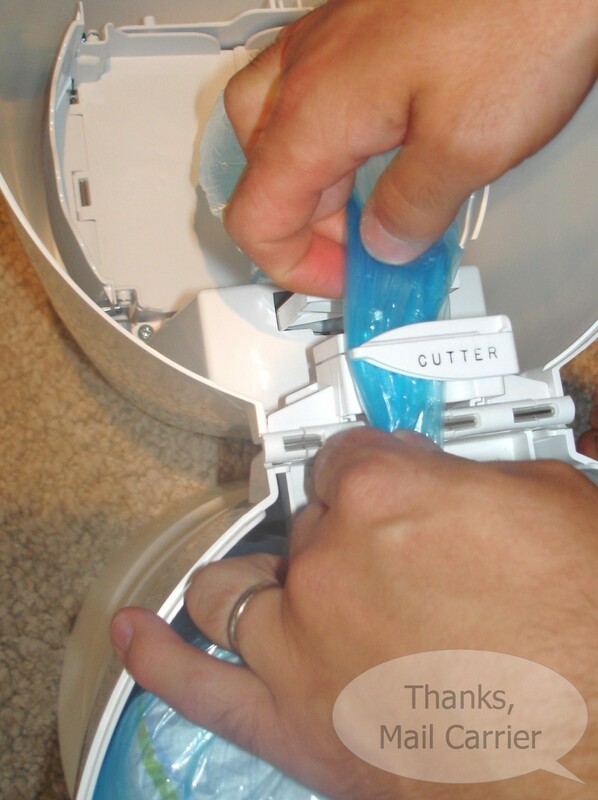 I love the pictures where you show how easy it is to dispose of a diaper! Following from Twitter Hop Thursday. Already following on twitter & GFC so am now following via RSS feed as well.